A new year, a new house, a renewed blog, a new focus on my quilting. My plans are to show more "how to" posts about quilting. WordPress allows a limited space for photos and videos. 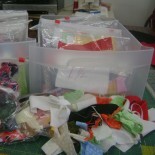 This blog is where I put videos and piecing instructions I want to archive without using space on my main blog. Please click on the link “My machine quilting blog” to see more of my quilting. Hi Anita, Are you still looking for tie labels? I probably have 1,000 of them. Please email me at ragmuffin5@comcast.net. Yes Terry I am still wanting labels. Thank you for thinking of me. I sent you my snail mail address by email. I hope you got it. I love your instructions and wonder if it is possible to make a rag quilt with men’s ties? Thanks for your clear instructions and great pictures. I learned a lot. Your details were amazing. How many wonderful people visited me?